A new automated method makes it easier for wildlife researchers to use photos to identify the unique markings of individual animals. “Many researchers need to identify and collect data on specific individuals in their work, for example, to estimate survival, reproduction, and movement,” says Derek Lee, associate research professor of biology at Penn State and principal scientist of the Wild Nature Institute. Lee uses photographs as part of a large ongoing study to understand births, deaths, and the movement of more than 3,000 giraffes in East Africa. He and his team take digital photos of each animal’s unique and unchanging spot patterns to identify them throughout their lives. But before pattern recognition software can process the images to identify individuals, the research team has to manually crop each photo or delineate an area of interest. Lee collaborated with scientists at Microsoft, who have provided a new image processing service to automate this essential and time-consuming process using machine-learning technology deployed on the Microsoft Azure cloud. 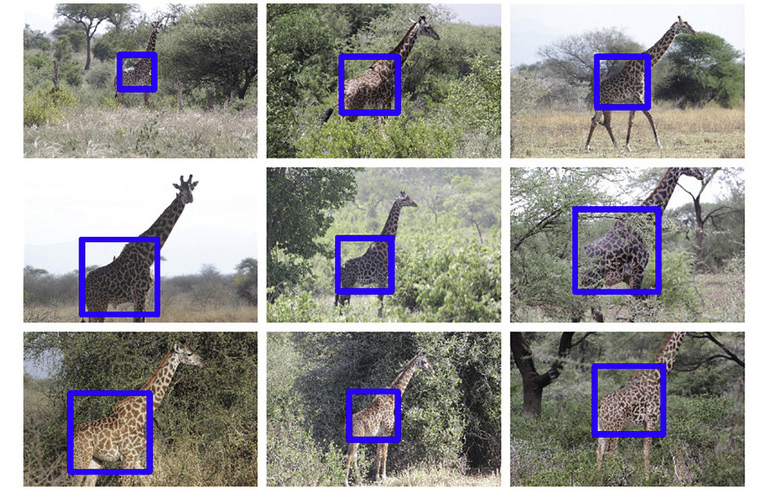 Using a computer algorithm for object detection, the Microsoft team trained a program to recognize giraffe torsos using existing photos that had been annotated by hand. The program was iteratively improved using an active learning process, where the system showed predicted cropping squares on new images to a human who could quickly verify or correct the results. These new images then went back into the training algorithm to further update and improve the program. The resulting system identifies—with a very high accuracy—the location of giraffe torsos in images, even when the giraffe is a small portion of the image or vegetation partially blocks its torso. The new system will dramatically accelerate Lee’s research on giraffe populations, which have rapidly declined across Africa due to habitat loss and illegal killing for meat. “Giraffe are big animals, and they cover big distances, so naturally we are using big data to learn where they are doing well, where they are not, and why, so we can protect and connect the areas important to giraffe conservation,” says Lee. This process will also be useful to researchers studying other animals with unique identifying patterns —including some wild cats, elephants, salamanders, fish, penguins, and marine mammals. A paper describing the work appears in Ecological Informatics. Partial funding came from the Sacramento Zoo, the Columbus Zoo, the Cincinnati Zoo, Safari West, Tierpark Berlin, and the Tulsa Zoo.